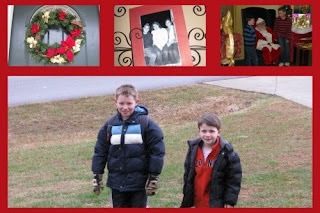 A while back, scrapbooker Ali Edwards posted a project on her blog called "A Week in the Life." The idea was to document everything you do in one week in an album with photos and journaling. I didn't think that week of mine was "album-worthy" enough to do the project at the time though. I hoped to do it later. 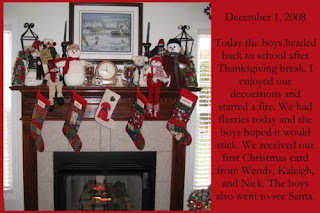 Well, Sunday night, I was sitting in the living room admiring our Christmas decorations after everyone was in bed. I love this time of year. Although I couldn't believe December 1 was right around the corner, I remember thinking how exciting this week was going to be. (I have a birthday AND wedding anniversary this week!) I decided now would be a good time to do that "week in the life" project. When I went to bed, I started planning out in my head how to organize the album. I also thought about a new Ali Edwards project - her December Daily album. For that album, she suggests making up an album in advance and then adding a photo and journaling for each day. I don't like to print photos out at home though, so I decided that album wouldn't work for me. Plus, I like to plan my pages around my photos and not the other way around. Then it hit me that I could combine both of her projects into one small album - stress free! Yesterday I took photos of the main things that happened in our day and made two 4x6 collages that included a total of five photos and the journaling for my day. Now when I get the photos printed at the end of the month, I can quickly put together a small album and have my favorite time of the year documented. Another thing I like about this method vs. having a premade album with each day marked is that if I don't get photos for a day, I can just skip it in the album. So, that's my crafty thinking for yesterday. I'm hoping I can stay on top of my daily photos. I like this idea! I might just try and do it too. That is a great project! We haven't got our tree yet so I feel out of the loop! Very good idea! Happy anniversary! That is a great idea. My anniversary is this week, too! Happy anniversary and happy birthday to you!